Where can you escape the world and slow down your pace? Where can you find an untouched land that still maintains the old customs of a rural culture that not even global technology has touched? The answer is quite simple: Agricola Neci, a mansion house made up of 4 independent suites (each one with its private entrance, bedroom, bathroom and living room) and a common dining room and kitchen. Agricola Neci is immersed in a 642 acres estate, where you can enjoy intimacy, privacy and relaxation in a secret world surrounded by the Tuscan countryside. Spend your time reading books, eating and drinking or enjoying the sites of our 642 acre estate. With truffle beds and olive groves on the estate, you can dedicate yourself to truffle hunting or harvesting olives to help make our very own olive oil - Olio Nece. If you are keen on athletic activities, there is plenty of things to do including kayaking in the private lake of the Agricola, walking up and down the hills or cycling in one of the world’s most beautiful landscapes. And if you are a fan of vintage bicycles, you can even participate in the famous Eroica: a race on ancient roads using vintage bicycles, surrounded by gorgeous scenery and fuelled by a mouth-watering selection of food and wine. And if it rains? You still have many activities to choose from including visiting the famous Archabbey of Monte Oliveto Maggiore with its Renaissance paintings on the life of St. Benedict, or touring Siena with its museums and art galleries. Or try Montalcino, the beautiful village in the breathtaking Val d’Orcia, renowned all over the world for the production of its precious Brunello wine. Whatever you want to do, one thing is for sure: during your stay in Agricola Neci you won't get bored! Apart the four suites there is a separate dining room which can seat up to 12 people. We stayed at Neci for two weeks with family and friends to celebrate my husband's birthday. We had no idea the property would be so stunning. When we arrived we drove through the beautiful iron gates to the generous villa overlooking Tuscan hills. It was even better than we had imagined! We were welcomed by Patrick, the owner, and Bruno the friendly dog, who took us on a tour of the substantial property on golf carts. The villa is extremely comfortable and each suite is very large and separate. We have very high standards and the accommodations were well appointed and luxurious. There is a separate building with a common kitchen and dining room, which worked out nicely for group dinners and parties. Patrick was available via phone to help us with any questions we had and he arranged for some chefs to come to the villa to cook for us. The property is truly a destination in itself and we spent many days at the villa swimming in the lake, kayaking, walking, and riding bikes and golf carts. The location is really ideal if you want to tour the many towns in Tuscany, go wine tasting, etc, but have privacy and the peacefulness of the Tuscan countryside. The whole experience was like a dream and we would love to stay again next time we are in Tuscany! Outstanding , Fantastic - Put on your bucket list!!!! The location is stunning, the property and surrounding estate is superb, the welcome from Patrick along with his hospitality all made for an unforgettable holiday in a truly stunning environment. Having arrived later than planned, Patrick took care of changing the restaurant reservation, which he had made initially for us, made us very welcome and arranged a time the next day for a tour of the grounds, a trip to the nearest local supermarket and artisan shops. This was invaluable information and ensured we had everything covered for the stay. We hired in local chefs for one evening (speak to Patrick he will arrange), and it is really well worth doing - not only are they the most lovely old couple (and spoke barely no English) the food was outstanding and served with a true sense of joy. Our whole family - spanning 3 generations had a wonderful evening with great wine and food...... just perfect. Not forgetting Bruno, the most laid back friendly hound you could wish to meet, which as a family of dog lovers put the icing on the cake. Whenever we return to Tuscany, there will be only one place I would consider staying ..... Agricola Neci - Salut Patrick. We came again, this time in summer. It is a place that combines wonderful landscape, designed and modern rooms, excellent service and unbelievable hospitality. I would recommend it, but I am afraid that it will always be booked and I cannot visit it again. So better go to the next proposal... it is just half as good as this one. The images of the countryside and surrounding villages will bring smiles to our faces for years to come. The hospitality of the owner and his staff was exemplary. Our four couples were ensconced in luxury in individual apartments and shared the common dining areas for breakfast and catered dinners. The private estate was open for our tour via golf carts. The listing description is accurate and I cannot recommend this villa enough! We recently spent a week at this wonderful property in Tuscany. First, we need to mention how wonderful a host Patrick Zinelli is. He came all the way from Rome to meet us at the property, but that was not all. He gave us a thorough tour of the property and grounds, invited us for a wonderful appetizer/dinner with local (and delicious) products, and the next day took us personally to his favorite places in Buonconvento (the nearest town), introducing us to the wonderful butchers, fruit vendors, and bakers in town. The house is beautifully appointed, very clean and, for our first day, had even a great spread for breakfast laid out for us in the common room. Each suite has separate entrances, and the views from the rooms were truly unforgettable. The grounds are extensive; we spent a day exploring it, canoeing in the lake and driving the golf carts up and down the beautiful hills, with Bruno (the property's dog, a sweet and active animal that will greet you every morning and will go everywhere you go, trotting along happily!). Gregorio and his wife, the groundskeepers, are simply amazing. Every day the would clean after us, lay the breakfast table, bring us fresh eggs from their hens, fix the beds - you name it! We called them the magical elves because all of this happened with us hardly ever seeing them. But, when we did see them, it was a pleasure; they are the nicest people ever, and it also was a pleasure to meet their beautiful daughter Anna. Gregorio even helped set up the BBQ one evening we were planning on cooking bistecca (the amazing meat from the region), brought us fresh zucchini and green beans from his garden, and the next morning it was all magically cleaned and ready to use again if we wanted! We truly recommend this place and will be back very soon. Thanks again Patrick for everything; we will see you again! 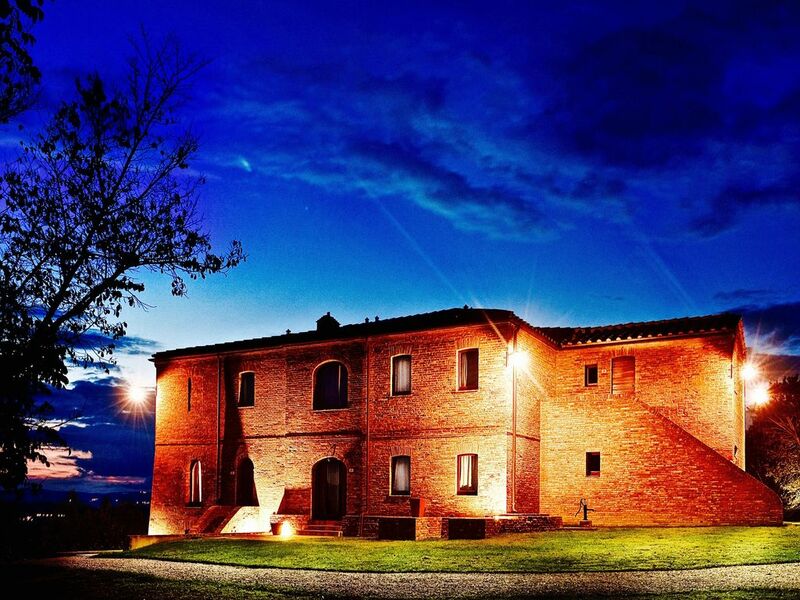 Fantastic property -- the perfect place from which to visit Tuscany! Our family had a wonderful stay at Agricola Neci. Reading the positive reviews and seeing the photos we had very high expectations, but our experience was even better than we hoped it would be. The location: great for seeing Tuscany. We took easy day trips to Florence, Siena, Montalcino, Pienza, and Montepulciano. None of them more than 2 hours away. Even closer are Chiusure, the Abbazia of Monte Olivieto and Buonconvento -- where you can get groceries and delicious treats. The property: Wow. Just wow. The setting is glorious. You really feel like you have your own private slice of Tuscany. Sunsets and sunrises are amazing to behold. The villa is beautiful and has every modern convenience. It consists of a large house made with re-claimed Tuscan bricks, with separate "apartments", each with a kitchen and fireplace. But a short distance (30 feet?) from the villa is another common house, with a gourmet kitchen, and dining table, along with a barbecue grill, and patio with a table and umbrella and chaise lounges, and is perfect for gathering everyone together for meals or drinks. Fabulous. There is a private pond that is swimmable, and two electric Club Cars (think golf carts that seat 4) for touring the hundreds of acres. Bikes are also provided. Best of all -- Bruno, a large and friendly dog who lives with Gregorio (one of the caretakers) visited us daily. He is wonderful and we all missed him when we left. The Host: Patrick and his staff are really great. They made feel right at home and provided touches of hospitality, such as bringing us farm-fresh eggs, that were delicious. Patrick even helped us to find a pair of local former restaurant owners who came on site and cooked for us dinner on our last night. Delicious and truly memorable! Our only regret? That we couldn't stay for another week at Agricola Neci! Agricola Neci is located just 10 miles away from Montalcino, the medieval village worldwide renowned for its Brunello wine and wineries tours are definitely a must of the area. Rates are subject to change until booking is confirmed. In case the group is made up of 6 people, only 3 rooms will be given. In order to get also the 4th room, a full price for 8 people must be paid.